Mr. Wochner assists clients with their estate planning and tax needs. He also has an extensive background in probate law and estate administration. Mr. Wochner represents clients in both commercial and residential real estate transactions. He advises business clients on the formation of business entities including corporations, limited liability companies, partnerships, and limited partnerships. Mr. Wochner was born in 1939. He was admitted to the Bar in 1964 after graduating from the University of Notre Dame with a degree in finance. He received his L.L.B. in 1964 from the University of Illinois. He joined Costigan & Wollrab, P.C. in 1964. Mr. Wochner is married and has five children. 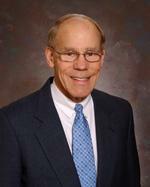 Mr. Wochner is a member of the Illinois State Bar Association and past president of the McLean County Bar Association. Mr. Wochner’s community activities include, trustee Holy Trinity Church; Board of Directors, Homes of Hope Charitable Foundation, Inc.; Board of Directors of Central Illinois Neurosciences Foundation and its Executive Committee; Past President of St. Mary’s Parish Council and Holy Trinity Board of Education; Past President of OSF St. Joseph Medical Center Foundation Council; past member, Board of Directors of United Cerebral Palsy of McLean County; past member, Board of Directors, Bloomington-Normal YMCA. Homes of Hope Charitable Foundation, Inc.